Annual Young Leaders Conference brings high school students to this college. 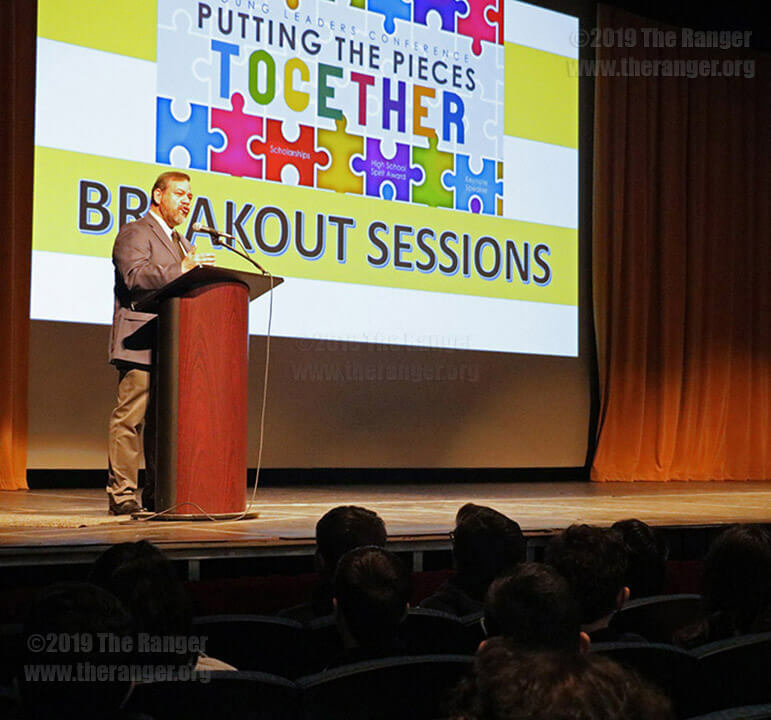 Life is not easy, but remaining positive helps people cope with problems, a district court judge told students and parents Feb. 23 at the Young Leaders Conference in the auditorium of McAllister Fine Arts Center. “Cherish every single day and be happy to be alive,” Judge Ron Rangel of the 379th District Court, told an audience of 250. This annual event is sponsored by the district’s Student Leadership Institute. “This event was to help high school students and parents prepare for college,” Rodell Asher, coordinator of student leadership, said. Rangel received bachelor’s and law degrees from St Mary’s University and has been a judge since 2008. He also teaches at the University of Texas at San Antonio. Rangel said that like everyone else, he faced challenges he had to overcome. On his quest to get an education, his father got sick and the family moved from house to house. “I didn’t really have a house I could call my own,” Rangel said. He had a child and had to drop out for a semester. His wife died of cancer six months ago. He told students not to give up fighting for what makes them happy. Rangel didn’t always want to be a lawyer. He felt insecure because he was from a poor family, and he believed lawyers were from wealthy backgrounds and well-educated. His father believed in him and wanted him to become a lawyer and knew he would be good at it, he said. He was the first college graduate in his family. His first case was a felony drug case, and the defendant was facing life in prison. Rangel said he thought he was in over his head, but he was able to keep his client from life in prison. The sentence was lessened to a few years in prison. After the trial, Rangel decided to gain more experience. He applied for jobs, but he said he was turned down because he did not believe in the death penalty. Finally, he was offered a position at the district attorney’s office in Edinburg. “Don’t be afraid to apply everywhere you want at job,” Rangel said. Rangel said he became a criminal defense attorney because he cared about people’s rights and the Constitution. Rangel said he found it important to speak to young people about his journey. He said he wants to help inspire people no matter where they come from. Another speaker, Francisco Solis, dean of performance excellence, told students to learn from their past and look to the future. Solis talked to students about finding their passion and preparing for their future. He quoted from “How to Make Extraordinary Things Happen” by Barry Posner and James M. Kouzes. “Stop reflecting on your past, attend to your present and prospect the future,” he said.